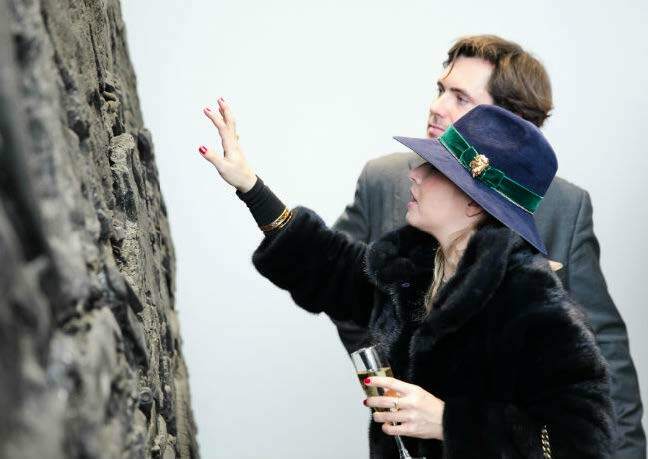 Richard Taittinger was born into one of the world’s most renowned champagne families, but instead of joining the family business, he decided to follow his passion and carve a name for himself in the art world, pursuing a master’s degree at Christie’s New York and by becoming a gallery director. Last week he opened Richard Taittinger Gallery in New York’s Lower East Side with a group show titled Sinthome that showcases the work of seven artists. I caught up with Taittinger to ask him about starting a gallery, the inspiration behind the inaugural show, and his plans for his new venture. Your family business is champagne. Why did you decide to venture into the art world? Earlier in my career, I worked in the wine industry, graduated from University of Burgundy, and worked in export markets promoting French wines and champagne. However, I decided to start from scratch and focus on my true passion: contemporary art. I was always inspired by the Paris Hotel Drouot auctions I attended when I was young. So, I moved in 2007 to New York to build experience, starting with the contemporary art department at Phillips de Pury. From there, I also worked in galleries in New York and Paris such as Almine Rech. Then in 2010 when I graduated from Christie’s Education, I decided to set up my own art advisory company to advise both institutions and private collections. Why the Lower East Side in New York? I’ve lived downtown for about eight years, and believe it or not, I first lived on Ludlow Street in a co-op. I have always been drawn to the energy and liveliness of the Lower East Side. I am so glad to be part of this wonderful neighborhood consisting of the most avant-garde and established galleries, the excellent New Museum, delicious restaurants, sophisticated hotels, and energetic nightlife. The gallery’s unique location in the Lower East Side rather than Chelsea provides a different, fresh platform on which to present artworks that will lead to Richard Taittinger Gallery’s success as the go-to gallery in the Lower East Side, where shows are consistently presented on a large scale with an institutional sensitivity and visionary program. What was the inspiration behind the theme of your opening show? How did you select the artists? The word sinthome is an archaic spelling of the word symptom in French used by psychoanalyst Jacques Lacan in order to describe the section of Borromean Knot’s fourth ring that holds together the real, symbolic, and imaginary realms of the psyche. The idea behind titling the show Sinthome was to unite the represented artists together under one common theme without dividing them. It is an impossible task given the variety of our artists’ cultures, geographies, and approaches, but through the concept of Sinthome, it opens many doors in understanding their work. The goal was to present all artists under an intellectual and conceptual frame that does not limit but rather expands the viewer’s own relationship to the work. What do you hope to accomplish with this gallery? Richard Taittinger Gallery presents some of the most thought-provoking international mid-career artists, with established reputations amongst collectors and institutions. Most important to me is facilitating the intimate relationship and high respect that I have for these amazing artists I represent, which I had developed for a long time as their friend, collector, and dealer. Since they were not currently represented by a gallery in the United States, it was necessary to establish a gallery in New York for them as a supportive platform to show their work to a larger audience, from institutions to art lovers.